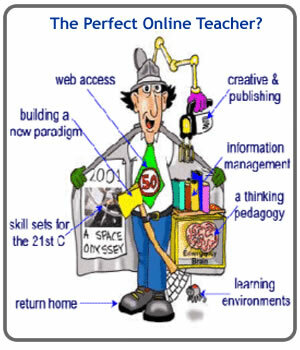 (question) Do I think the cartoon “The Perfect Online Teacher” is a fair depiction of the title? For the most part the “Perfect Online Teacher” cartoon appears complete, albeit generalized. Implied in the cartoon are qualities pertaining specifically to the skill of teaching however this is not included as a characteristic. In the pre-assigned reading “Teaching and spinning a web of meaning” we learn from Terry Anderson (2004) that a quality e-teacher must (1) be an excellent teacher, (2) have sufficient technical skills and (3) have resilience, perseverance and be innovative. Anderson’s second quality is likely addressed under the characteristic of “information management” however the ambiguity of the remaining characteristics warrants the argument that a distinct label pertaining to Anderson’s first and third qualities should be incorporated. (question) Do you think The Digital Taxonomy is a valuable tool for integrating technology into the classroom? Churches (2007) reconceptualization of Bloom’s Taxonomy is a valuable tool for integrating technology into curricula. The list of higher order thinking skills will help educators create effective lessons that will better stimulate this new generation of learner. The charted progression from lower order to higher order thinking can be a complex process to understand however the communication spectrum simplifies this by providing methods that will assist teachers in moving their lessons towards higher level thinking. Churches’ taxonomy is organized logically and offers pertinent information for transitioning teachers from the traditional model to a teaching model based on technology integration. As someone who is attempting to integrate technology into the Christian Ethics 20 curriculum via the Ipad, Churches reconceptualised taxonomy will be of great help. I envision the taxonomy assisting me in all facets of how I teach this course. I thought I would end with the following link, http://www.schrockguide.net/bloomin-apps.html. Some of you may be working through Ipad challenges as well or many of you may have heard of Kathy Schrock. This is her site and on it she organizes popular Google applications, Ipad applications, Android applications, and Web 2.0 applications by Bloom’s taxonomy. A valuable site for those who want to use applications in a course but are unsure which app requires higher order thinking. (question) Critically analyze the strength of the proposed relationship between WebQuests, the Digital Taxonomy (Churches 2011) and inquiry-based approaches to learning. Inquiry-based learning approaches emphasize the need for student learning to be investigative and student-driven. Students are forced to hone their synthesizing and organizing skills as they work through inquiry-based learning experiences. If the task truly employs inquiry-based learning than the final product will be unique and individualistic. Inquiry-based learning meshes well with the Digital Taxonomy as inquiry-based projects typically require higher order thinking. 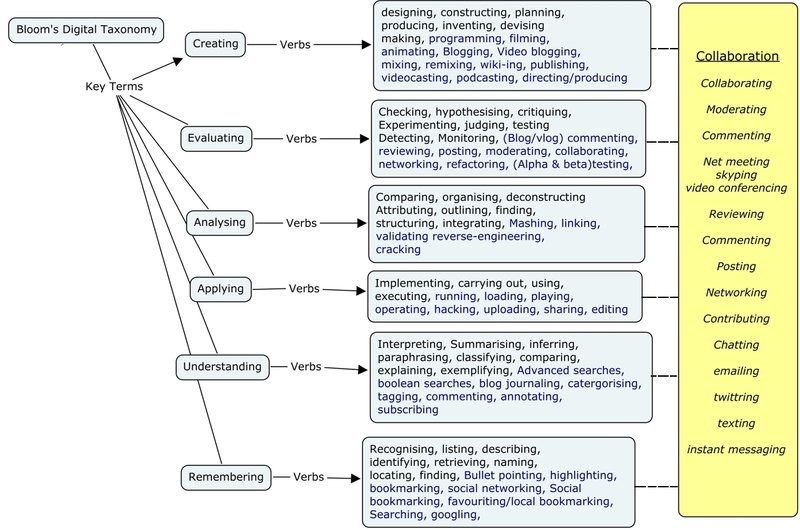 Language distinct to the higher order thinking section of the Digital Taxonomy (e.g., designing, constructing) is commonplace during inquiry-based learning. As well, the process for inquiry-based learning often requires collaboration, discussion, moderation and negotiation: components of the communication spectrum on the Digital Taxonomy. The assigned readings clearly suggest that a correctly orchestrated WebQuest achieves a place at the top of the Digital Taxonomy hierarchy. We learned that WebQuests should challenge students to apply what they know and what they have learned to create something new (March, 2003). A WebQuest, if created well, is intrinsically linked to inquiry-based learning as its primary function is to encourage investigation. The over-arching strength of each of these tools (i.e., inquiry based learning, Digital Taxonomy, and web quest) is the high level of learning that takes place when each tool is employed properly.